﻿ The Anchorage - Ohio. Find It Here. 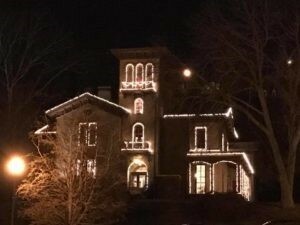 Overlooking Historic Harmar Village in Marietta, Ohio, is the imposing ashlar sandstone Italian villa known as "The Anchorage" and "Putnam Villa". This home, built in 1859 by Douglas Putnam for his wife, Eliza, comprises 22 rooms and a grand tall campanile that fronts the house. From the tower room, the largest part of Marietta and its two rivers can be viewed. John Slocomb was the architect and master builder. The walls are made of 24" thick sandstone quarried from the top of the hill behind the house. The foundation is of solid rock and all wood used in the house is locally grown oak. ?The Anchorage is best remembered as Edward MacTaggert's residence. Using wealth accumulated from oil wells in Oklahoma, Mr. MacTaggart restored the home and furnished it with treasures from his many worldwide travels. From the tower room, the largest part of Marietta and its two rivers can be viewed. This mansion served as the residence of many prominent Marietta citizens including Harry Knox (Knox Boatyard), Dorothy James Robers (author), and Sophia Russell (Marietta College). The mansion is currently undergoing restoration sponsored by the Washington County Historical Society.